Hirsutism causes women to grow excess body hair, including on the face. The hair that grows as a result of hirsutism can be thick, coarse and dark, and can be a source of embarrassment for many women. Shaving is a good way to quickly get rid of the hair, although you must do it often to reduce the chance of masculine stubble on the face. Apply a warm compress to your face by dampening a towel with warm or hot water and pressing it on your skin for at least two minutes. This will help open the pores and soften the hair for a cleaner shave and a reduced risk of ingrown hairs. Dispense a quarter-size amount of a good-quality shave gel into your hands. Rub together to create a lather, and then apply to your face. It's important to choose a moisturizing shave gel over soap. As you shave, you remove the top layer of skin as well; the shave gel acts as a barrier to prevent razor burn. You can also choose a more feminine scent so the shaving experience doesn't seem so inherently masculine. Choose a new, sharp razor, and begin using a downward stroke in quick, short movements to remove the hair. 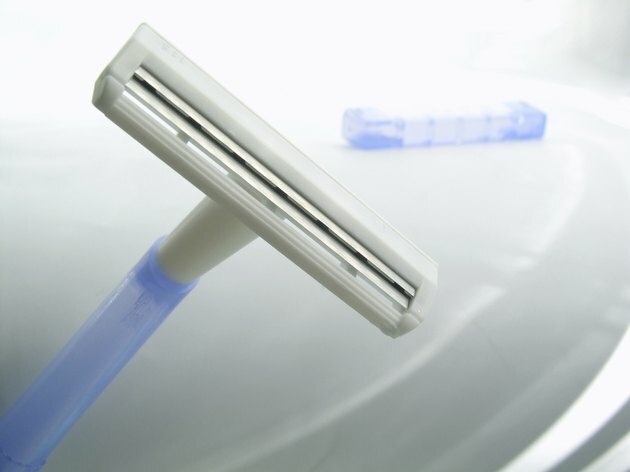 While you may be tempted to stroke upward for a closer shave, the FDA recommends shaving in the same direction as the hair growth to decrease the risk of ingrown hairs, something to be especially careful about when shaving the face. Rinse away the shaving cream when you're finished shaving. If you notice any irritation, apply a 1 percent hydrocortisone solution, suggests the American Academy of Family Physicians. Shave frequently. Once you've shaved, the new growth will appear as blunt-edged stubble and may be highly noticeable. Add shaving to your skin care regimen daily if necessary. Use another method of facial hair removal if you cannot shave often; waxing and plucking both remove the hair from the bottom of the shaft, resulting in slower, finer growth. Take care when shaving around areas like the neck, around the nose and on the chin. They can be difficult to reach and are thin-skinned and prone to cuts and nicks.